This after sun cream with Extra Virgin Olive Oil moisturises and protects the skin, and allows for regeneration. 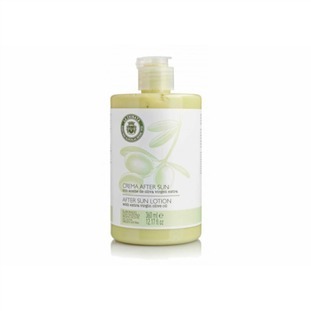 It contains Aloe Vera, which guarantees a soothing and regenerating effect on wind- or sunburnt skin. One of the most important cosmetic functions of olive oil is its great ability to protect the skin against UV light, preventing erythemas and reddening of the skin. · It's a rich source of essential fatty acids, helping to restore the natural moisture level of the skin. · The principal component of olive oil, oleic acid, is an integral part of cell membranes and skin. · Olive oil has a soothing and softening effect on skin and it's even used for therapuetic massages. · It has a noticable tonifying effect on the upper skin. · It protects the skin against external factors and preserves the integral structure of the dermis, allowing better regeneration and enhanced skin firmness. LA CHINATA is a family business with no less than four generations of history behind it, based in the town of Plasencia, among the green hills of northern Extremadura. The name La Chinata has its origin in the word used to describe the residents of Malpartida, a village near Plasencia where the Oliva family has its roots. The history of the company per se kicked off in 1932, when the family bought its first olive grove in the famous Jerte valley. The value of extra virgin oil in cosmetics is amazing as it contains a high content of polyphenols. Moreover, its acidity is perfectly suitable for every type of skin making it smooth, moisturized and healthy while it protects it against free radicals that accelerate the aging of skin.